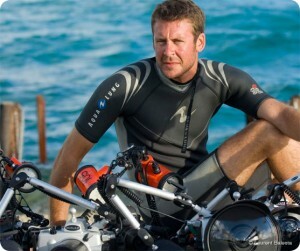 To learn more about the Blancpain Fifty Fathoms used on the Gombessa Expedition, visit blancpain.com. In 1762, a man by the names James Arnold opened a small workshop in London. Over the next 250 years, his small workshop would grow and become home to one of the best known watchmakers: Arnold & Son. Since it’s meager beginnings, the British based company has grown and flourished, producing a variety of complications which have stunned the world. Now they have revealed their latest accomplishment: the Ultra Thin Tourbillon Escapement, or UTTE for short. The UTTE clocks in at a slim 8.34mm thick, making it the thinnest tourbillon in the world. The star of Arnold & Son’s UTTE is the movement contained within the piece. The brand new caliber A&S8200 is a tourbillon movement which measures a mere 2.97mm thick and 14mm in diameter. The movement was created entirely in-house by Arnold & Son in La Chaux-de-Fonds. The minuscule movement took several years of development to create, but is well worth the wait. In addition to being the thinnest tourbillon in existence, the A&S8200 was engineered to use the same double-barrel system common in Arnold & Son timepieces. This results in a miraculously thin movement with a spectacular 80 hour power reserve. The A&S8200 is a mechanical feat on it’s own, but overall the UTTE is an aesthetic wonder. Set into a 42mm case, the dial of this piece features a beautiful radial design, complimenting both the time display with Roman numerals and the tourbillon, which also functions as a minute indicator. The UTTE will be available in rose gold and palladium. It will be produced in a limited edition of 50 pieces of each metal. To learn more about Arnold & Son and the thinnest tourbillon, visit www.arnoldandson.com. Last May, Girard-Perregaux revealed a piece unlike any on the market. Inspired by timepieces from the end of the 19th century, the piece harkened back to another time. Despite it’s vintage roots, the piece had a certain modernity, giving it an overall timeless effect. This piece was the Girard-Perregaux Vintage 1945 Tourbillon with Three Gold Bridges. The Girard-Perregaux Vintage 1945 Tourbillon with Three Gold Bridges features a case and bridges fashioned from pink gold, brilliantly contrasting the the anthracite coated gray tone of the main plate. Each bridge is given special attention, first openworked and then carefully hand-polished. Each skeletonized bridge is completed with delicate hand-guilloching. A total of seven days is required to obtain a perfect finish on the Girard-Perregaux Vintage 1945 Tourbillon with Three Gold Bridges, due to the number of close angles and minute details. This attention to detail gives the Girard-Perregaux Vintage 1945 Tourbillon with Three Gold Bridges a distinct look. The intricate inner workings of the piece also received special attention. The tourbillon within the piece requires the assemblage of 72 components, which are assembled in a diameter of 12mm. Inside the Girard-Perregaux Vintage 1945 Tourbillon with Three Gold Bridges beats the self-winding caliber GP9600, which features a micro-rotor beneath the barrel. The detailed insides of the piece can be seen through the sapphire crystal case back. The Girard-Perregaux Vintage 1945 Tourbillon with Three Gold Bridges features a power reserve of 48 hours, demonstrating a perfect blend of craftmanship and technological skill. Getting your hands on one of these spectacular pieces may be a bit difficult, however, as the edition was limited to a total of 50 pieces. To learn more about the Girard-Perregaux Vintage 1945 Tourbillon with Three Gold Bridges, visit www.girard-perregaux.com. Baselworld and SIHH are two of world’s greatest horological shows. Watchmakers from all over the world participate in both of these events, making them a watch enthusiasts dream. Both take place in Switzerland, however, making it a bit difficult for many to enjoy the stunning pieces and events at these horological shows. But not all horological shows require a plane ticket to Switzerland. This past week, from April 8th to April 13th, the third annual Madison Avenue Watch Week took place in New York City. Featuring a myriad of exhibitions and product previews from luxury watch designers, Madison Avenue Watch Week was a huge hit. Boutiques between 57th and 86th streets opened their doors to participate in the event. Madison Avenue Watch Week featured a broad range of price points and styles; from vintage timepieces to luxury pieces. This years events included a Girard-Perregaux watchmaking demonstration, a Breguet watch viewing, a private viewing of Hublot’s 2013 collection, and an F.P. Journe sneak preview. Participants this year included Antiquorum, Asprey, Blancpain, Breguet, Biccellati, Chopard, David Yurman, De Grisogono, F.P. Journe, Fabergé, George Jensen, Girard-Perregaux, Graff Diamonds, Hublot, Montblanc, Porsche Design, and Vacheron Constantin. To learn more about Madison Avenue Watch Week, visit www.madisonavenuewatchweek.com. In 2010, Chopard made a bold move. All of the timepieces in their Imperiale Collection were redesigned entirely in honor of the 20th birthday of the collection. Now, in keeping with the luxurious design which the Imperiale Collection is known for, Chopard is launching a gorgeous new timepiece. The timepiece has aptly been named the Chopard Imperiale Chronograph All Black. Despite it’s monochromatic color palette, the Chopard Imperial Chronograph All Black is designed to play with light in an incredible way, paying homage to the Imperiale Collection. The dial is a flat black, and is surrounded by a circle of luminescent white diamonds. Roman numerals highlight the time, while arabesque motifs evoke a sense of nobility and elegance. The hands are designed to resemble the tapered daggers which sovereigns used in combat. Furthermore, the crown resembles a lotus flower and, in keeping with monochromatic feel of the piece, is adorned with onyx. The Chopard Imperiale Chronograph All Black is made from stainless steel coated in DLC (Diamond-Like Carbon). The strap of the piece is also coated in DLC. The timepiece is self-winding and beats at 28,800 vibrations per hour. It features a 42 hour power reserve, and is resistant to 50 meters. All of this is packed into a stunning 40mm case. The Chopard Imperiale Chronograph All Black is an excellent timepiece, and the perfect blend of beauty and sophistication. To learn more about Chopard’s Imperiale Collection and the Chopard Imperiale Chronograph All Black, visit www.chopard.com.